Mumbai, if we’re being honest (aren’t we always), is a place like no other. Often described as a tale of two cities—from Bollywood to the world’s largest slum economy, the crazy charm of the city formerly known as Bombay is sure to get under your skin in more ways than one. Now, we get it. Your travel FOMO has seen you plan yet another trip where you’ve overcommitted yourself to more internal flights than you can remember—we’ve all been there. If you (like us) are often left making each and every hour count, welcome. 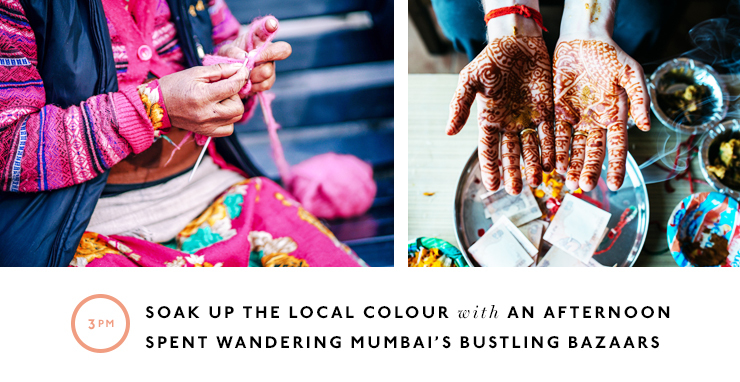 48 hours in Mumbai will be hectic (as you’d expect), but also 147% worth it, especially seeing as we’ve rounded up the best things to see, do and most importantly eat—because not only are we awesome like that, but we know that’s really why we’re all here. OK team, #yougotdis. High tail it out of the airport; there is literally no time to waste. Jump in your pre-booked tourist taxi (hot tip: visit the tourist taxi counter before you exit the airport and say a kind, but firm, no thanks to the guy that offers to carry your bags) and buckle in. This is your first introduction to the crazy wonder that is Mumbai—buckle up! Now guys, this is the ultimate way to do Mumbai, meaning there is only one place to stay—The Taj Mahal Hotel. As far as your hotel bucket list goes, this spot should be right up there. Standing proud for over 100 years, this five-star hotel is one of Mumbai’s top attractions (according to, you know, every single guide book worth reading), so think of it not only as an investment in your comfort, but also the best way to maximise those precious 48 hours. Treat yo’self and upgrade to a room facing the Arabian Sea, you’ll be glad you did. Make sure you find the photos of past guests in the lobby and wonder if you’re staying in the same room as Mick Jagger or Wills & Kate, the list goes on. Also, now is probably a good time to mention the pool? Okay, we’ll stop now, we’re sure you get the idea. We get it; you’re starving (maybe a little hangry). So before you contemplate taking a piece out of your travel buddy (guilty), take a stroll around the corner to Bademiya Seekh Kebabs. Grab a chicken kebab and eat it on the street, it’s time to tourist. Mumbai has many a monument, but you my friend have only 48 hours. So let’s start with the big guns—the Gateway Of India. Overlooking the Arabian Sea, it was built way back in 1924 to commemorate the visit of King George V and Queen Mary. Depending on how you want to spend your time, you can always jump on a boat and head to Elephanta Island. Speaking of monuments, the Chhatrapati Shivaji Terminus railway station is another one that tops many a list. A UNESCO world heritage site, you might find it more epic from the outside, but it’s still worth a visit. You’ll wind up across the road from Oval Maidan, and depending on what day it is you’ll likely come across a game of cricket (or ten). If you’re after a true taste of local life this one is worth navigating Mumbai traffic for. Whether you get your stroll on or take a seat, it’s a great spot for soaking it all in. You’re hungry again, aren’t you? Thought so. Get excited because it’s time for a street food tour that’s sure to put you into a nice ol’ food coma. Mumbai is known for its street food but we’ll forgive you for not wanting to spend your 48 hours on the toilet—too much? Take a street food tour to try everything from dosa (fermented crepe with rice and black lentils) to savoury pastries and of course, a range of local sweets to finish. Remember those two worlds we were talking about earlier? Well, you’re about to get a first hand look. In the interest of full disclosure, I wasn’t originally keen on a slum tour. It conjured up mental images of Western tourists following a lady with a flag, snapping their cameras at unsuspecting locals. I couldn’t have been more wrong. Reality Tours are the O.G. slum tours in Mumbai and they return 80% of tour profits to the local community through their NGO, Reality Gives, in the way of education programs. In a small group of no more than six, and with absolutely no cameras allowed, you’ll experience the Dharavi Slum, one of the largest in Asia, and home to nearly one million inhabitants with a local guide. They’ll also answer all your questions about life in Mumbai, and take you for a visit to Dhobi Ghat, the still very much functioning outdoor laundry. You’ve had your mind officially blown and now it’s time for a beer. Head to Leopold Cafe, the spot that’s been feeding hungry travellers since 1871 and think back to what life must have been like a cheeky 100+ years ago. Servings are pretty decent here (we learnt the hard way), and you name it they have it—curries, burgers, Chinese, or even pasta, the list goes on. It wouldn’t be a trip to Mumbai without a wander through the city’s bustling bazaars. Take it from us, there are many. The Chor Bazaar, which literally translated means thieves’ market, is filled to the brim with antiques and random collectables, and the Crawford Market built during the days of the British Raj is another must-see. When the crowds get too much it’s time to head back to your palace for beers and pool hangs before getting ready for dinner. From street food one night to fine dining the next, cue The Table. Voted best restaurant in India and also listed in Asia’s Top 500 Best Restaurant, you’ll want to book ahead and then settle on in. This is the perfect spot for sharesies, and you can’t go past the spicy salmon tartar with jalapenos and the shrimp dumplings in spicy ginger broth. Their cocktails are worth sampling and their wine list features the best drops from India and overseas. Like we said, settle on in you’re going to be here a while. 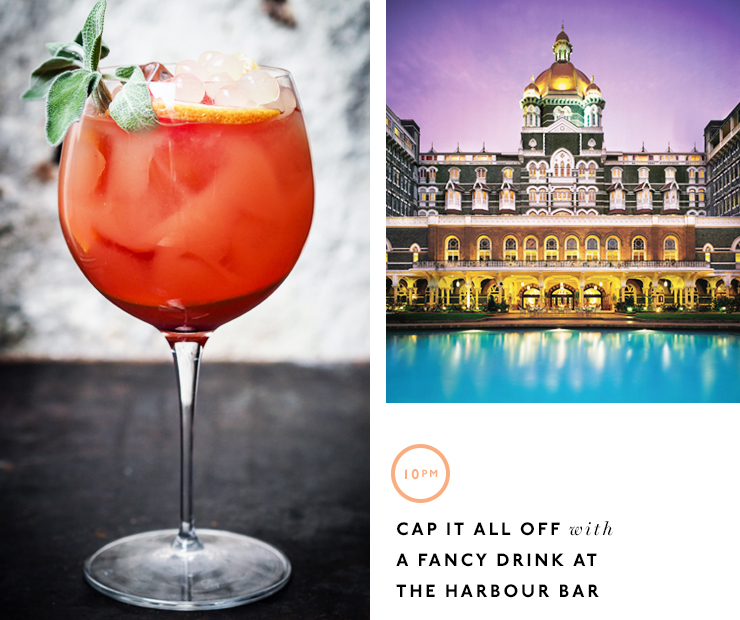 It’s no surprise that the city’s oldest hotel has the city’s oldest bar, and The Harbour Bar is the perfect spot to round out your decadent night, Mumbai style. And quicker than a Mumbai minute your 48 hours is up! On the way to the airport have your cabbie take a detour past Antilla, the world’s most expensive house. It’s just another example of the two worlds we spoke about earlier, and you should definitely ask your cabbie what he knows, everyone seems to have a different take on the place. Home to just five people, and some say up to 200 servants, this $1 billion property is the perfect site to round out your visit. Since we're in India, have you checked out Goa?